If you have never been to Taiwan, you’re missing out on one of the world's most captivating destinations. From scenic landscapes, winding gorges, and misty mountains to tropical white-sand beaches and its most exquisite anthology of classic Chinese architecture, Taiwan, although small, is a land of many marvels. Let's take a look at the some of the interesting places to visit in this country, many of them telling a fascinating story. Once upon a time, on Qimei Island, there lived a loving couple. One day, the husband went out to fish and did not return. The wife waited for her husband on the shore, where she died due to hunger and cold. The villagers buried her by the seashore until a rock, on the same spot, had miraculously taken the shape of a pregnant woman lying on her back. Today, the locals remember this legend by naming it the Waiting for Husband Rock. More than 500 years ago, legend has it that seven women jumped to their deaths down a well to avoid being captured by ravagers raiding the island. Later, the villagers filled the well with earth where seven trees eventually grew and have been flourishing to this day. Thus, it gained the name of the Tomb of the Seven Beauties. This spectacular rocky platform that resembles the shape of an Eastern dragon, which you can only see clearly when viewed from above. Also found on Qimei Island is a rock formation known as the Little Taiwan. This popular sweet potato-shaped rock resembles the form of its the land it is named after and only appears during the low tide. One of the many stone formations found on Qimei Island is the Great Stone Lion, made out of basalt from the nearby volcano. Its form resembles the animal squatting on the cliff and overlooking the endless ocean under a misty gray sky. The Twin-Hearts Stone Weir is a traditional fish trap built with basalt and coral reefs. Because of its romantic shape, it has attracted many couples around the world, making it one of Taiwan's most popular attractions. Exploring Tunnel 88 is like discovering a secret treasure trove. According to history, before it was enlarged by the Republic of China Armed Forces in the 70’s, it was a place of refuge from bandits. Today, the main tunnel is known for storing jugs of old wine and Kaoliang spirits. The Erkan Village is a government-protected habitation situated on the island of Penghu. Here, you will find traditional-style structures, stone and wood carvings, and an amazing collection of antique calligraphy and paintings. Today, Erkan Village still keeps its ancient cultures and traditions, allowing future generations to follow the paths of their ancestors. Fascinating, isn’t it? 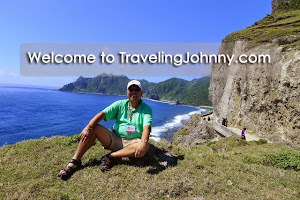 Until then, this is your friendly global traveler, Johnny, signing out!